Imagine the near future without petroleum, as we try to sustain ourselves and do things in a more natural or austere way. Such as, no plastic hoses replaceable for watering gardens just when we'll have to do more local gardening for a post-petroleum food supply. If this were not a serious enough challenge, it turns out that plastics are full of poisons that kill living things including people. Think of it as a permanent, toxic oil spill. The dangers of plastics have been ignored and suppressed for decades, but the recent news on the extent that plastics are killing sea animals and birds will finally raise the human health issue through the environmental focus. As the danger of the plastics plague may not sink in for years, many people pondering the future today will still mentally cling to their plastic-dependent lifestyles and the perpetuation of the modern industrial economy that relies on myriad forms of petroleum. As we will see in this report, alternative plant-based plastics are not going to do the trick for the world economy. Recycling plastics, as we also learn, is also not very feasible. "About 250 billion pounds of raw plastic pellets are produced annually worldwide and turned into a tremendous variety of products, from cars and computers to packaging and pens." (Wired News, June 5, 2004). People think of oil mainly as the strategic fuel for their cars, and some Americans justify a foreign policy that kills for oil. If they knew how dependent they were on massive amounts of plastic from oil and natural gas for other basic modern products, the war cry could be louder. However, health-worries during the rising cancer epidemic could counter the demand for endless plastic. Plastics, cheap energy, clean drinking water and almost all other key resources are about to become sharply limited. This limitation, brought about by the world's growing population rapidly depleting resources, is a defining aspect of our civilization running up against an immovable wall. This report draws upon this writer's personal knowledge from his days working for the petroleum industry and then as a defender of the Earth. I've been fortunate to meet leaders such as Captain Charles Moore, who more than anyone worldwide has broken the story on the tragic pollution of the seas caused by plastics. A major news report on plastics as an environmental hazard (from Scripps Howard newspaper service, July 20), was a groundbreaker. By itself it did not put the "plague of plastics" into daily public discourse; we have a long way to go. However, that article said absolutely nothing about the serious effect on public health from plastics. There is plenty of evidence (read on). When the full impact of plastics dawns on vocal mainstream people, it could become bigger than the concern over Genetically Modified Organisms currently being slipped into our food and unleashed into nature. People don't realize the biotech industry works hand-in-glove with the petroleum industry. For example, Monsanto is a petrochemical company. They want to control seeds so that farmers will have to buy their herbicides; a pesticide-resistant GMO-crop can have its field get dowsed with profitable poisons that will kill all other organisms such as "weeds." (New York Times, my letter to the editor of Feb. 13, 2002, "Raising Pure Food"). Food, plastics, petroleum and biotech are intertwined and need to be examined in a new light. Bottle caps and other plastic objects are visible inside the decomposed carcass of this Laysan albatross on Kure Atoll, which lies in a remote and virtually uninhabited region of the North Pacific. The animal is a juvenile who was fed the objects by its parents who foraged them from thousands of miles of the north Pacific Ocean..
"California added diethylhexyl phthalate (DEHP) &quot a compound used to make plastics flexible  to the list of known reproductive toxicants regulated under the state statute called Proposition 65. Polyvinyl chloride (PVC) typically contains up to 40 percent DEHP. The chemical, which leaches out of PVC products such as blood-storage bags and intravenous tubing, can disrupt the normal development of mail reproductive organs in animals... Manufacturers now have 1 year to label affected products to be sold in California as containing a reproductive poison. Neither the federal government nor any other state has acted against DEHP..." &quot Science News, 11-03. There has been a plastics-industry conspiracy to keep the health consequences quiet. "The PVC industry has known about the carcinogenicity of VCM (a component of polyvinyl chloride) since about 1970," reports Paul Goettlich in an article published in October 2001 titled "PVC: A Health Hazard From Production through Disposal". Goettlich is one of the foremost experts on plastics, and recently alerted the health-conscious public in a seminal article "Get Plastics Out of Your Diet." (Living Nutrition, Spring 2004). Bisphenol-A is a synthetic estrogen present in many plastics. On a minute basis, .1 (point-one) part per billion, a gene is turned on or off, leading to various ailments such as weight gain. Nalgene polycarbonate bottles, which degrade with time, contain bisphenol-A. The significance of the tiny exposures affecting health adversely, causing birth defects and cancers, means that the conventional wisdom of large exposures' being the real risk is wrong. Oops! The amount of research showing the harm to fetuses from minute traces of phthalates, pesticides and other endocrine disruptors has confirmed the massive threat of heretofore "harmless" amounts of chemicals, according to Dr. John Peterson Myers, an author of Our Stolen Future. Dr. Myers gave a frightening presentation on August 27 in San Francisco at An International Dialogue, sponsored by the Global Recycling Council of the California Resource Recovery Association. Plastics debris and minute plastic particles floating in huge expanses of the Pacific Ocean are six times as prevalent weight-wise than the plankton there. Our webpage shows some disturbing pictures that are nothing unusual these days. 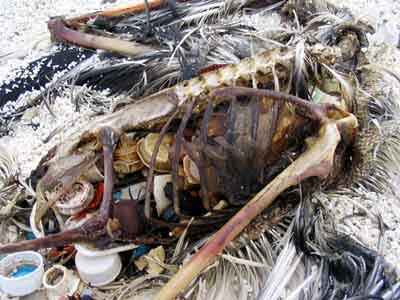 Birds and fish eat plastics constantly, and starve to death. Even worse, the extremely high concentration of toxic chemicals adhering to the plastics eaten by the animals goes into their fat cells. As the poisons go up the food chain and accumulate, this in one reason we can no longer safely eat tuna. However research is still needed on how much of a food-fish's toxicity derives from plastic as opposed to general pollution and non-plastic sources. Poisoned sea animals are all over the world, due to the easy migration of chemicals through the air and bodies of water. This is why Eskimos often have dangerously high levels of PCBs in their breast milk. Plastic from petroleum does not biodegrade. It breaks down, especially with UV radiation, into finer and finer particles. This makes plastic and the lingering toxicants easier to ingest. Some plastic particles, such as the "nurdles" pictured above that are used as raw material for making plastics, are confused by sea creatures and birds to be eggs or other prey. Captain Moore concluded upon his research cruises: "A fourth of the planet's surface area has become an accumulator of floating plastic debris. What can be done with this new class of products made specifically to defeat natural recycling? How can the dictum 'In ecosystems, everything is used' be made to work with plastic?" The focus has been on the sea, due in part to the proximity many activists and researchers have to the Pacific Ocean. But land animals have problems with plastic as well. Aside from the human animal, many species are threatened by trash as well as development of wild land into human industrial communities and suburbs. A recent Los Angeles Times article had this headline: "Developer Wants to Ease Condor Rules". The story opened with, "The Tejon Ranch Co. has applied for a federal permit to protect developers if they accidentally harm or kill the endangered California condor by building three projects on the vast ranch north of Los Angeles." The scheme is a 23,000-home residential project, a 1,450-acre warehouse park and a mountain resort community along Interstate 5 in the Tehachapi Mountains. "I have a clipping showing the stomach contents of a dead juvenile California Condor containing plastic objects, so we can assume that land birds are also dying from plastic ingestion." - Captain Charles Moore, email to Culture Change, June 2004. X-ray of turtles being treated at a clinic in Florida yielded contents in just one turtle that were found to be balloons and a fast-food latex glove. The many kinds of plastics and their additives such as heavy metals and DEHP (the plasticizer to be warning-labeled in California) make recycling problematic. Additionally, plastic does not recycle well due to the properties of its fibers, and if more than a small amount of recycled plastic is put into new production of plastics, the result is an inferior and unprofitable product. It is a fraud upon the public that the "chasing arrows" on plastic containers imply recyclability and recycled content. The types of plastics and varieties of containers that can actually be recycled are few and far between. What's more, the plastics industry including soft-drink corporations have been let off from collecting or recycling their poisonous garbage. Apart from some lower-grade materials, such as park benches and some garments made from recycled plastic, utilization of recycled plastics is mostly a myth and a non-starter. "'Curbside collection will reduce the amount of plastic landfilled.' Not necessarily. If establishing collection makes plastic packages seem more environmentally friendly, people may feel comfortable buying more. Curbside plastic collection programs, intended to reduce municipal plastic waste, might backfire if total use rises faster than collection. Since only a fraction of certain types of plastic could realistically be captured by a curbside program, the net impact of initiating curbside collection could be an increase in the amount of plastic landfilled. Furthermore, since most plastic reprocessing leads to secondary products that are not themselves recycled, this material is only temporarily diverted from landfills. In today's world of mega-corporate business, corrupt government and an academia wearing blinders, it is often the nonscientist who treads unwelcome into the public arena in what is often considered a rude (but justified) fashion. Activists do this day in and day out, and are ignored to the best extent that the big money can muster. This may be the main reason for the formation of the new Campaign Against the Plastics Plague. (More on this California state-wide coalition later in this report.) CAPP intends to see a twenty-five cent payment for each plastic bag used at retail, which will go into environmental clean up and education against plastics from petroleum. This would make a dent in the problem, but you'll want to see more done, and fast, the more you find out about plastics. As a former petroleum analyst relied upon by industry and government, I am a specialist. A specialist is someone who society does respect in its worship of authority, science and, sadly, non-artistic expertise. In my many years of fighting petroleum pollution and showing alternatives to petroleum dependence, I have constantly come upon examples of blatant disregard for the environment and public health. However, the most sinister and far-reaching shock I have experienced in regard to our fossil-fueled technological way of life is the effects of plastics and the horrifying extent of their spread. The time is over for more research as a substitute for decisive action, and it is everyday citizens who need to carry it out immediately. What to do? Just say no to plastics. This might be as difficult as a drug addict having to "just say no" to drugs. It is time to reject our own complicity. If we want to eat bean dip, we must make it from scratch or go to a restaurant. How many of those plastic containers do we really reuse, anyway? And now that we know plastic is unsafe, we need to fight for a consensus that plastics have had their day, at least in allowing further spread. CAPP is a beginning, but to really cap it, an unprecedented movement would have to mobilized. Or, the demise of petroleum supply that some analysts anticipate shortly will have to be the form of action to permanently cap the plastics plague. Meanwhile, or in anticipation of the collapse ahead of petroleum civilization, doing more than trying to reject plastics means changing our lifestyle toward simpler, less materialistic living. The Campaign Against the Plastics Plague has a coalition of advisers who had their first meeting, June 14, 2004 in Newport Beach, California. A mission statement was approved, and a few weeks later the national press got a taste of the problem. Just to consider one product, bicycles: they are a sustainable alternative to cars, so we cannot ignore the plastics component of bikes. Tires for bikes (and cars) were once made out of the rubber plant, and that has to recommence. Rubber (from the tree) is not a plastic, although plasticizers are put into plastics for pliability. Petroleum has become indispensable to almost every aspect of modern society's operation. Retooling relevant factories for sustainability is not even in contingency planning as yet. The trend is the other direction, as more and more parts for bicycles (and cars) are made of plastic. As the petroleum-driven economy's machinery churns along and eats up the Earth and the biosphere, people who bother to think about plastics assume that nonpetroleum sources are around the corner. Besides needing to face an unprecedented crisis, it is timely to examine the feasibility of alternative materials as well as the recycling of plastics. The picture is not hopeful. Nevertheless, Teresa Heinz Kerry and Ray Anderson (the carpet manufacturer who had a big awakening) are good candidates for tackling the issue, as they both know a lot about cradle-to-cradle product positioning for a sustainable future. However, a focus on recycling plastics misses the greater reality in front of our noses which is the health issue, as we have seen. Plastics made from plants (PLA and PHA), unlike petroleum-plastics, offer biodegradability. 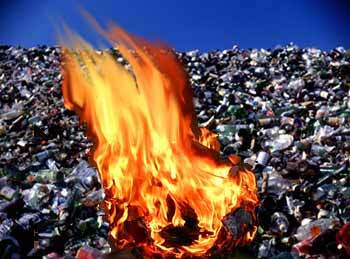 But Scientific American went on to remind us that this "helps to relieve the problem of solid-waste disposal, but degradation gives off greenhouse gases, thereby compromising air quality. Plant-based PLA and PHA by fermentation are technologically simpler to produce than PHA grown in corn, but they compete with other needs for agricultural land." Corporate-agribusiness efforts to make plastics already utilize genetically modified organisms. Most corn and soy grown in the U.S. is already GMO. The big money will still be in trying to mold nature to yield more features for making plastics out of crops. Specifically, to eliminate extra steps to process plastics out of crops, new procedures researched have been about producing the plastic directly in the plant. As yet, most biodegradable plastic products have been composed of about 50% petroleum plastics, according to Paul Goettlich. However, beyond the threat to the environment and our health posed by GMOs, the corporations by engaging in agricultural strip mining for making biomass for plastics or alcohol fuels  would further degrade land that is already losing topsoil at a rate hundreds of times faster than nature normally would allow. However, how many million acres need to be planted to yield quantities of vegetable plastic for the global economy? The same question needs to be asked when boosters of hemp claim the plant will meet so many of our modern industrial needs. It was the Lundberg Letter, formerly "the bible of the oil industry," that first called the growing of corn for ethanol for gasohol "agricultural strip mining." We need to question the alleged socioeconomic needs of petroleum substitutes, and ask how many millions of people are supposed to use these materials for how many decades. But the bigger question is, don't people need to eat the potatoes and eggplant we can grow? The land needs to be used for other essential purposes, rather than growing plastic parts for unnecessary motor vehicles or kitchen equipment, for example. Monocrops are against species diversity. However, regardless of what people may wish as policy to satisfy their material wants, the energy to produce massive quantities of biomass for non-food purposes will not be available without abundant, cheap petroleum resources [Pimentel, Cornell University]. The Society of the Plastics Industry had me speak at its annual convention around 1990 in Newport, Rhode Island. These nice people had no concept of petroleum resource limitations that I said were going to bear down on their industry and themselves personally. I concluded my speech by suggesting they diversify and get out of the plastics business. They received my comments well and had many questions on both oil reserves and how shortage affects the market. I've not been asked back to this group's conventions, but I would gladly tell them the same thing again for another $2,500 honorarium. For alternatives to today's ongoing plastics' going into the waste stream, see the appendix below. Or you can look at the picture above. Too bad she's poisoning herself. In the early 1970s at a petroleum market-information company I worked for, I saw people sucking and chewing on plastic pens at their desks. One sees school children do the same thing. I used to say as I passed my co-workers' office doors, '"Hey, don't you know about plastic transfer syndrome?" The reaction of my co-workers was to furrow their brows and shake their heads. They had not heard of such a disease, and they already knew me to to joke and be a health nut who liked organic food. However, my original reasoning that there was molecular transfer was from the fact that a certain chemical flavor filled one's mouth from the petroleum-plastic pens. I had made up "plastic transfer syndrome" and knew nothing about the real chemistry and physics involved, but it turns out I was probably naming a range of real diseases prevalent today. The cancer epidemic that was already underway in the early 1970s is still going thanks in part to PVCs which make pens thereby containing dioxin and PCBs that leach into our skin (or mouths). Also in the early 1970s I began a lifelong habit of scraping the surface of cheese to get rid of that which was contacted by plastic wrapper "migration" was sensed! It turns out that European cheese packaging uses a different plastic today than in the U.S., because of the very problem I was paranoid about three decades ago without any foundation. However, my "paranoia" might have been due to hearing things in the mid '70s such as inside information from Chevron that the company had to change its wax product for milk cartons because it was carcinogenic. One solution, of course, is to avoid animal products which require energy-intensive growing / transport / packaging. The threats we all face in these times are nothing like what seemed to be what we were up against three decades ago. Regulating or stopping one poison or another does no good, when other toxicants substitute and the global "waste economy" grows. The U.S. phased out lead from motor vehicles, a process I helped the U.S. Environmental Protection Agency accomplish with my reports on the oil market. However, it was eventually widely known that boosting octane through alternatives to lead involved other toxic additives, and from the start the lack of lead demanded more energy to be consumed at the refinery level to boost octane. The real alternative to oil, lead and plastics is no car, because even "clean cars" are monumentally polluting, contrary to green propaganda. An effective approach to fighting plastics means reducing petroleum consumption across the board. We need to do so anyway, as the world peak in global oil extraction is happening about now. Natural gas is getting tighter in supply as well. There will not be a set of alternatives ready to substitute for astronomically high oil and gas prices, because of lack of planning in corrupt, materialist societies. Maximum energy conservation of nonrenewable resources is essential. For example, bike carts need to be a major industry. Highway building must stop immediately. People must do without cars, refrigerators, computers, etc. ("What?!") It's either drastic reductions or complete collapse of the petroleum-driven economy, along with more poisons into the environment and our bodies. The choice is ours. So, for starters our reusable shopping bags (that we stash in bike saddle-bags!) are going to get more use. We cannot wait for reforms when the pace of modern life makes us miss opportunities to survive. The twenty-five cent deposit on plastic bags will do wonders, but must be in the spirit of a revolution for conservation. Opening our minds to a new way of living will make it easier to free ourselves from the twin unfounded assumptions that we will always need and have plastics and that they can be safe "enough.". 1. Plastic packaging offers advantages such as flexibility and light weight, but it creates problems including consumption of fossil resources, pollution, and high energy use in manufacturing; accumulation of wasted plastic in the environment; migration of polymers and additives into foods; and an abundance of public misinformation about plastics issues. 2. Curbside collection of discarded plastics is expensive and has limited benefits in reducing environmental impacts, diverting resources from waste, or achieving mandated recycling goals. Residential curbside collection in Berkeley would capture only about 132 tons a year - less than one-half of one percent of municipal discards. 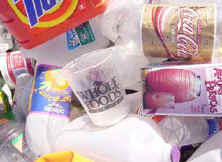 Plastics that go into a curbside recycling bin get recycled. Curbside collection will reduce the amount of plastic landfilled. A chasing arrows symbol means a plastic container is recyclable. Packaging resins are made from petroleum refineries waste. Plastics recyclers pay to promote plastics recyclability. Using plastic containers conserves energy. Our choice is limited to recycling or wasting. Reduce the use source reduction. The details of each point above can be read in the link for the whole Berkeley Plastics Task Force report. Algalita Marine Research Foundation, maker of the movie, "Our Synthetic Sea" available for purchase. Earth Resource Foundation's "Sea Turtles Don't Shop" anti-plastic bag campaign. Scripps Howard plastics article in Seattle daily newspaper. "Paper or plastic?" Why the kill-for-oil culture will collapse and die. Trash society, trash fashion, trash worship. Donate to the Campaign Against the Plastics Plague (tax deductible; sponsored by the Earth Resource Foundation) to help us help you and the countless creatures harmed by petroleum/plastics. Thank you. To support Culture Change/Sustainable Energy Institute and its projects, make a tax-deductible donation.